By Friday this should all be a distant dream…. Hopefully! | An alien voice under a duvet of dreams. Posted by phoenixaeon in A330, BtVS, Diablo 3, ECA, End of A330, I am a new kind of crazy!, My poor brain, Mythology, OU. I’m so close. Like <-> this close. But now the writing of every word is as painful and frustrating as getting Princi to throw her smoothie cartons in the bin. Nigh on impossible! Yes, I’m talking about the mythology EMA. In the words – or abbreviations – of today’s youth: Oh. Em. Gee! 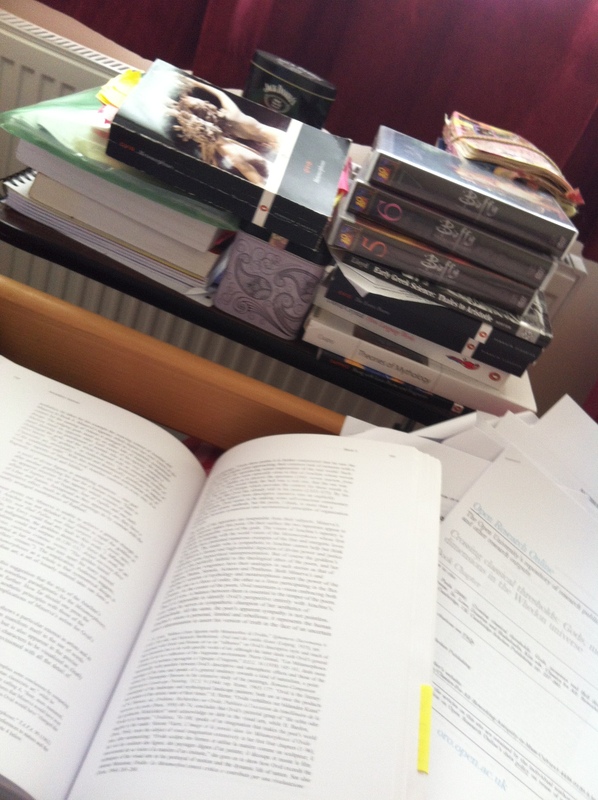 This essay is a headwreck! And 3,000 words for a final essay? That’s just a joke! The should have been more. At least a thousand more! I feel like I’m picking a gnat’s teeth trying to weave my way through the sparseness of this word desert. Holy heck, I tell you. Holy heck! But at least I get to watch Buffy as study. So it’s not all bad. And soon the studying shall be over! Woohoo! Who am I kidding? It’s all bad. But as long as I get 70%. I could make do with a pass 2. I won’t say happy, as happiness comes in distinctions, but I doubt I’ll get that with my rubbish. I’m not even sure if I’ve answered the ‘question’/statement. Oh well. Only time will tell. 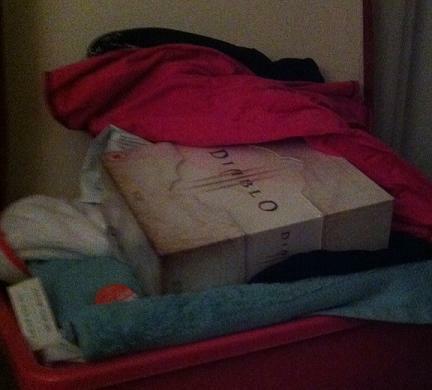 My lonely and forlorn copy of Diablo 3, slowly being consumed by a small pile of clean clothes. So, three more days and I should be done. Freedom, here I come! And freedom consists of reading something I am really looking forward to reading, buying a new laptop, and playing Diablo 3. Oh, I’m so excited! Both have been sitting there patiently – the story and the game, that is – quitely calling for me to pay them attention. But Pandora has nearly arrived, and I shall… Oh, best rethink that sentence! That was bordering on uinintended innuendo! Yep. This essay has officially driven me crazy. In fact, Angel, Buffy and Trueblood seems to be the only TV we’re consuming at the moment. Perhaps we should check our pulses. D’oh! I missed the rest of your comment… No, they’re not videos. They’re complete seasons on DVD 😀 (3, 5, and 6). And I too got the whole set for about £50 too. Have you read Keith Topping’s The Complete Slayer? It’s an episode by episode guide and done from a British perspective. Good book, well worth a read, and quite funny too. Ooh, no, I haven’t. Might look into that 😀 But it’s a bit late for the essay. I’m just about to print it out and get it ready for sending. Ah, the dreaded ECA time … so many memories! Can’t believe you’re complaining about it being only 3000 words though: the fewer the better for me. It just means less to re-draft, edit, filter, rinse and repeat. 3000 is probably standard for an article too, so maybe when you’re done you can send it in for publication. Seriously, there’s loads of interest in Buffy articles. Yeah, but they’re Buffy articles with some sort of quality. This essay is totally pants. Oh, yeah. And I’ve finally finished it.